Parker, Colorado. 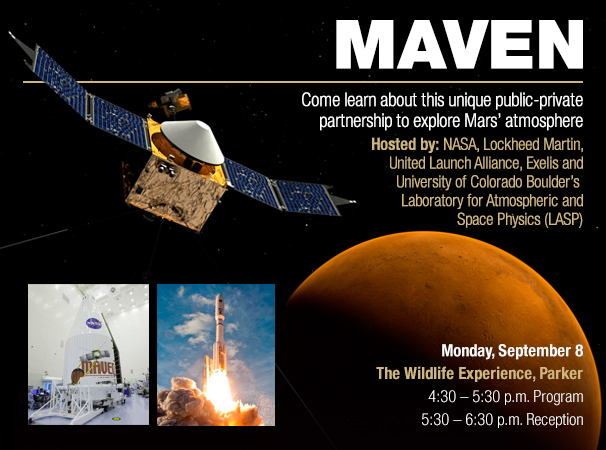 August 30, 2014 – The public is invited to meet Colorado’s aerospace leaders and learn about a unique public-private partnership to explore Mars’ atmosphere on Monday, September 8. Speakers will discuss the importance of the Mars Atmosphere and Volatile Evolution (MAVEN) mission, the involvement of Colorado’s companies in space exploration, and the value of public/private partnerships involving university-based research. The event and reception will be held at The Wildlife Experience, 10035 S. Peoria Street in Parker. Registration begins at 4 p.m. The program begins at 4:30 p.m., followed by a reception at 5:30 p.m. The event is free, but you must register in advance. MAVEN is traveling to Mars to explore how the Red Planet may have lost its atmosphere over billions of years. By analyzing the planet’s upper atmosphere and measuring current rates of atmospheric loss, MAVEN scientists hope to understand how Mars transitioned from a warm, wet planet to the dry, desert world we see today. MAVEN was launched on November 18, 2013, and will go into orbit around Mars on the evening of September 21, 2014. MAVEN is exemplary of a federally-funded research project at CU-Boulder that has led to several key Colorado aerospace businesses playing critical roles in the build, launch and subsequent data collection of the mission. The event will be hosted by Lockheed Martin, United Launch Alliance, Exelis, and University of Colorado Boulder’s Laboratory for Atmospheric and Space Physics.